Compared to any other drawing table on the market this is, without a doubt unrivaled considering its quality, superior strength, and durability all with a lifetime guarantee. It also assures the customers value for their money and time invested in the product. Its qualities and design are top notches with all of its parts made up of the highest quality materials. This table is made of high-quality steel which is 18-gauge. The legs are firmly attached together by welding thus making the table strong and very durable and ensuring its efficiency when being used.This also makes the table rigid enough to support its function. All the other constituent parts of the table are made considering the highest quality requirements and expectations of the buyer. Its constituent metal parts are made with a scratch resistant material; making it a long-lasting product with the tabletop board of the table made of 3/4” thermo-fuse Melamine. Its top surface is well smoothened and durable. This drawing table stands out considering its high quality and surpassing all of the buyer’s expectations and offering a long lasting functionality of the product itself. 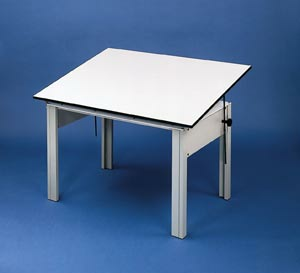 The height of the drawing table is 28” for convenient access from your workstation or desk with its tabletop having dimensions of 36”w by 48”l accomodating a suitable working space. The top has an adjustment range of 0 to 45 degrees to be switched to the required comfortable working position. Its base weight is 91lbs providing maximum stability for the drawing table itself, and the material is steel available in a variety of colors based on the customer’s preference on the purchase. The table's top color is also available in various colors to be chosen on purchase. DesignMaster Office Height Drawing Table stands out as unrivaled considering its quality both in product design, functionality, finishing and material durability and resilience. Unlike other products with warranties, this product offers a lifetime assurance to the buyer considering its quality design and manufacture that has the intent to meet all of the artist’s requirements.